Whether you are for or against Honolulu rail transit, I think we can all agree that we need to reduce traffic and reduce parking hassles today. Let’s focus on what we have already: TheBus, which offers 100 fixed routes across Oahu, with an average weekday ridership of 236,000 people and 72,500,00 people each year, according to TheBus Facts. It’s effective, it’s flexible, and it’s affordable for riders. Note: TheBus is already being subsidized by Hawaii taxpayers – it cost $175.2 million to operate in 2009 (Honolulu Operating Budget FY2009, page 17) but recovered only $43.8 million in passenger fares (Honolulu Comprehensive Annual Financial Report FY2009, page 46). 1. Local celebrities on TheBus. We could partner with local news and entertainment celebrities to ride TheBus on random days and random routes. There could be a “Spot the Celebrity” game, with small giveaways or coupons. Celebrities might give an impromptu performance or just get people talking with each other and creating a sense of community. 2. Add WiFi on TheBus. To encourage riders, we could expand Honolulu Hotzones and offer free WiFi service on TheBus. This would benefit riders with longer commutes. 2. Build more TheBus park-and-ride facilities. There are currently only five park-and-ride facilities, in Hawaii Kai, Mililani, Royal Kunia, Wahiawa, and Haleiwa. We should build new parking facilities near bus routes. 3. Expand TheBus special event routes. There are five Oahu venues that could really benefit from special bus routes: Aloha Stadium (for swap meets, football games, carnivals); Magic Island (for carnivals and fireworks); the North Shore (for surfing competitions); the State Capitol, Civic Fairgrounds, and Honolulu Hale (for special events and rallies); and Waikiki (for parades, fireworks, and block parties). 5. Offer TV news programming on TheBus. Partnering with private companies, buses could have one or two TV screens showing muted, closed caption TV programming, with local news, information (such as the weather, traffic, or public service announcements), and limited paid advertising. What else can we do to make the most of the mass transit and traffic solutions we already have? For the 2008-2009 school year, the Department of Education (DOE) managed a $2.246 billion budget (2009 Superintendent’s Annual Report) to educate 177,871 enrolled students. Yet Hawaii’s public schools are underperforming. For No Child Left Behind, only 65% of public school students met proficiency objectives in reading, and only 45% met proficiency objectives in math (State of Hawaii NCLB School Report, School Year 2008-2009). Education Week grades Hawaii public schools a C, with D in K-12 Achievement (“Education Week’s Quality Counts 2010”). 1. Get rid of excess union bargaining units. Hawaii should only negotiate with two unions: one representing teachers and principals, and the other representing administrators and support staff. With only two benefits packages, for 12-month employees and 10-month employees, Hawaii could save money on payroll and administration costs. Why do we need so many bargaining units, each with their own sets of benefits? How can school administrators keep up with all of the payroll codes and plans? 2. Reassign teachers and principals at underperforming schools. If a school can’t meet performance benchmarks, we need to replace the teachers and the principal. Some teachers could be reassigned to new schools; others may ask for a mentor to help them improve their teaching skills. 3. Offer bonuses to high-performing teachers who are willing to relocate to an underperforming school and mentor a teacher there. This will raise the performance of teachers at all schools. 4. Convert more public schools to charter schools. Let students and their parents decide which school is best for them. Let school administrators have more control over teachers, budgets, and facilities. 5. Give principals more control over hiring teachers. Letting principals choose the teachers they want to teach at their school – and letting them choose who will not teach at their school – could improve school performance. The best teachers would be rewarded, while unmotivated or ineffective teachers would have an incentive to improve their teaching skills. As a CEO, how effective could you be if you couldn’t hire and fire your employees? 6. Design more accurate performance reports. For example, graduation drop-out rates include students who transfer between Hawaii schools (but who actually graduate); and test scores include the 19,504 “English Language Learners” (ELLs), who make up 11% of the student body (2009 Superintendent’s Annual Report). Yes, we need to evaluate the performance of all students; but we should not penalize an entire school for enrolling a large number of non-English speakers. These are just a few ideas for motivating teachers, principals, and schools. How else can we give Hawaii children a competitive education? In the 2008 Hawaii election, 269 candidates raised $13,197,012 (State of Hawaii Campaign Spending Commission). That’s a lot of money, especially when the economy is still struggling. So as the next local election approaches, I’d like to propose some common-sense campaign finance reforms to protect us – and our donations. 1. Candidates must file for a position before fundraising. It seems dishonest to form “exploratory committees” that raise money for a campaign without a commitment to run for that position. What happens if the politician doesn’t run for that office? Is the money returned to donors or just added to the politician’s “war chest”? 2. No campaigning or fundraising during office hours or the regular work week. Fundraising should not take time away from the job that an elected official already has. Fundraising can be done after-hours or while the Legislature or Council is not in session. 3. Strict limits on out-of-state contributions to local campaigns. This allows part-time residents or former residents to have a voice in Hawaii elections, while preventing undue influence by nonresidents or national organizations who don’t live here. What kind of limits do you think are reasonable? 4. Weekly reporting of campaign donations. Candidates and elected officials should publish standard weekly donor lists on their website or in contribution reports whenever they receive donations, regardless of whether it is an election year. Right now, reporting requirements vary. 5. Donations to a political candidate should be used for that candidate’s race, not donated to another campaign or political action committee. When donors support a specific candidate, they should be assured that their money will support their candidate’s election or re-election, not someone else’s. Candidates should donate their own money to campaigns they support. 6. No unspent campaign funds disbursed to a political party. Donors may support a specific candidate, but not necessarily the political party to which they belong. Unspent campaign funds should be saved in a campaign fund or donated to a local charity or nonprofit organization. We should all be confident that donations are used to help the candidate, and that local voices are not drowned out by national interests. How else can we make our elections more honest? This year, TheBus will retire 28 40-foot TMC RTS buses and 12 35-foot TMC RTS buses, according to the City and County of Honolulu Department of Transportation Services. If those buses are in good mechanical repair, then why not turn them into temporary housing? The buses are mobile, durable, secure, and private. We just need to make them comfortable. In April 2010, the “UH Go Green Fashion Competition” challenged Apparel Product Design & Merchandising (APDM) students at the University of Hawaii to turn recycled junk into “Trash Chic.” Why not buses? 1. Buses would be stripped of all seating and handrails. Only the driver’s seat would remain, though teams may choose to reupholster or replace the chair. 2. We could open the design contest to students, government departments, home building and furnishing companies, and non-profit organizations. The contest could be sponsored by the Department of Housing and other agencies. 3. Each design team would have a budget of $500 for materials (paint, flooring, wall coverings, window finishes, lighting, and furniture). All work must be done by the team, except for any electrical work. The goal is to recycle, reuse, and repurpose items in order to save money and minimize waste. 4. The home design must address two needs: waking (with areas for work, study, and dining) and sleeping (for 2-5 people). 5. When the challenge is complete, teams would submit a floor plan, receipts, and explanations for how items were recycled, reused, or repurposed. Not only would this let us find a new use for retired buses and give homeless families a temporary place to live, it would also challenge all of us about how much we throw away. I don’t know how we would choose the families who would use these temporary shelters, or how long they could stay there, or even where they could park these mobile homes. Let’s talk about it! There are a lot of books that tell us what’s wrong with America. But most of them don’t tell us how we can make things right. 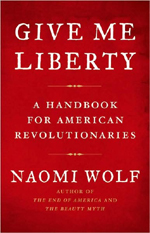 “Give Me Liberty: A Handbook for American Revolutionaries” (2008) by Naomi Wolf does both – with a conversational, easy-to-read style. Wolf reveals the frustrations and freedoms of our political system, and highlights seven principles of American liberty. 1. We are required to speak freely. 2. We have a duty to rebel continually against injustice and oppression. 3. Ordinary people are supposed to run things. 4. Americans cherish the Rule of Law. 5. America establishes no God. 6. Americans deliberate with their neighbors; we disagree without violence. 7. Liberty is universal; America cannot maintain an oppressive empire. “Give Me Liberty” reminds us that we have a right and a duty to rebel against an oppressive government. It explains that the “pursuit of happiness” in the “Declaration of Independence” is not about pursuing pleasure, but about citizenship and enfranchisement. It asserts that patriotism is not about unquestioning obedience, but about challenging government policies and self-correction. Most importantly, “Give Me Liberty” gives us practical advice about how we can become citizen leaders and change public policy. One of Wolf’s suggestions is to exercise our free speech and start deliberating with our neighbors again, discussing the community and political issues that are important to us. Wolf cautions, “Remember that deliberation is different from advocacy: you’re inviting people to grapple with an issue, not to try to persuade them to adopt one view” (page 280). 1. Recruit your family, friends, and neighbors. 2. Be clear about the agenda and goals, whether it is an open discussion or there are specific issues you want to tackle. 3. If you want to discuss specific issues, offer basic information before the meeting. 4. Have written guidelines about listening, not interrupting, and common courtesy. 5. Choose a fair and neutral “facilitator” who will watch the time, participation, and agenda. 6. Set up a flip-chart and choose a note-taker who will write down ideas and suggestions. 7. If you have more than 10 people, divide up into smaller groups so that everyone has a chance to speak. 8. Summarize the ideas and action items, and ask people how you can make the next meeting better. Naomi Wolf (http://www.naomiwolf.org/) is an author, speaker, and co-founder of the Woodhull Institute for Ethical Leadership and the American Freedom Campaign. You are currently browsing the Better Hawaii weblog archives for May 2010.